Californians who opposed the recently-passed gas tax increase have another reason to be outraged. To California Governor Jerry Brown, those who are tired of being unfairly taxed are “freeloaders” and he’s “had enough of them.” Those were the words he used when he spoke at an event at Orange County, earlier this month, reported SHTFPlan.com. 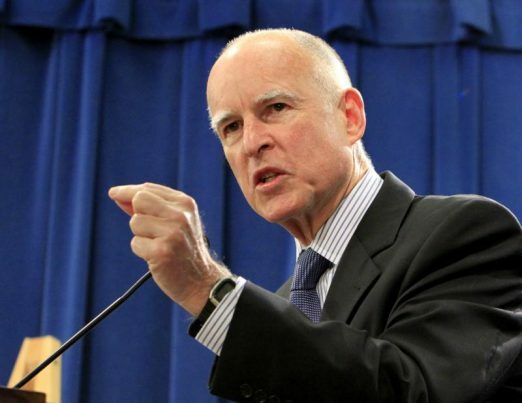 “Roads require money to fix,” Brown stated, arguing that the tax increase would help fix the state’s roads, which are known to be some of the worst in the country. Considering California already has the seventh highest gas tax in the country, it’s no wonder middle-class voters are more than a little incensed. The transportation package will raise the excise taxes of gas and diesel from 18 and 16 cents a gallon to 30 and 36 cents a gallon, respectively. It doesn’t stop there, however. According to the SacBee.com, a special sales tax on diesel would triple from 1.75 percent to 5.75 percent, while car registration fees may increase by as much as $175, depending on the vehicle. Moreover, of the collected funds, about $330 million will go to the Transit and Intercity Rail Capital Program, California’s high-speed rail system that is 50 percent over budget and seven years past its proposed deadline. A further $300 million will be funneled into the State Transit Assistance fund, a fund that assists local agencies in paying for light rail systems and streetcars. Finally, at least $100 million annually will be spent on California’s Active Transportation Program, which is supposed to increase the number of Californians who commute on bike and on foot. These are just a fraction of the figures that can be derived from Brown’s $52 billion tax hike. Apparently, the annual gas tax increase of $50 isn’t enough for the state that has 12 percent of the nation’s residents yet 34 percent of its welfare recipients. Blessedly, not everyone is taking this lying down. California State Assemblyman Travis Allen has spoken out against this ridiculous tax hike, explicitly telling Reason.com that: “California has plenty of money to fix our roads.” The Republican legislator has asserted that the increase wouldn’t be necessary if the revenue meant to go into road maintenance and repair weren’t being drained for other uses. Specifically, the general fund. Allen intends on putting Brown’s transportation package on the November 2018 ballot. This is so that the people of California can be given a voice in this matter by voting for or against it. As of writing, Allen’s initiative is undergoing analysis from the state attorney general. Should it be approved by July 8, then Allen and his associates have 150 days to gather 365,000 signatures needed to place the initiative on the ballot. Go to Collapsifornia.com to remain up to date on all the goings-on in what is supposed to be The Golden State.